St. Louis is a city filled with ghosts. It is a place built on a foundation of mud, blood, river water, and beer, but ghosts can be found in almost every nook and cranny. A city with a past that is so filled with violence and death must have at least a ghost or two lurking in its darkest corners, right? Yes, but St. Louis is a city with more than just a ghost or two. Tales of spooks and specters began to be told in the earliest days of the city, and by the nineteenth century, became commonplace in the daily newspapers. They were not stories that were just being told over a glass of beer in the local tavern – they were everywhere. And the tradition continues today. The city is filled with haunted houses, haunted historic sites, spirit-infested graveyards, churches, schools, university buildings, and more. 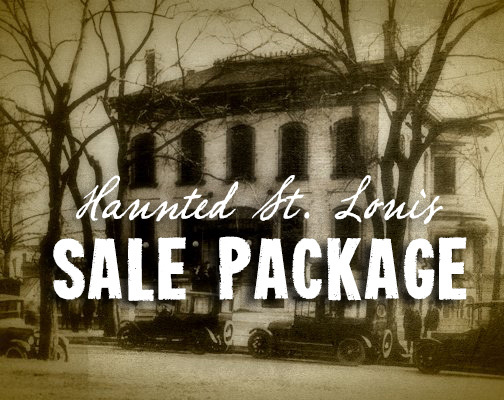 St. Louis is also home to one of the most haunted houses in America and to a supernatural event that not only inspired books and films, but has never been fully explained -- even after 70 years! Author Troy Taylor has been researching and writing about St. Louis for more than 20 years and has produced four different books on St. Louis hauntings (including his bestselling title, which was just updated with a second edition this year) and has more titles currently in the works. His book The Devil Came to St. Louis has been featured in a number of documentaries and television shows and is currently being adapted as a major studio film release. Use the links below to order! St. Louis is a city filled with ghosts. It is a place built on a foundation mud, blood, river water, and beer and, of course, a long history of spirits and specters. Unlike other cities with a history of violence and death, there isn’t just a ghost or two lurking in the city’s dark corners. In St. Louis, they are everywhere, permeating every story, every legend, and every historical event from its long and storied past. You may think you know the spirits of St. Louis but get ready – you haven’t seen anything yet! More than a decade and a half ago, author Troy Taylor presented one of the first books ever written about the many ghosts, hauntings, and strange tales of St. Louis. After all these years, he returns to the city for a deeper, darker look at its haunted history with updated tales, new stories, and chilling accounts that have never appeared in print before. It’s a brand-new look at one of America’s most haunted cities! Discover how history and hauntings have shaped the course of the city from its early days, through the Civil War era, to the grand spectacle of the 1904 World’s Fair! Read page-turning tales of haunted hotels, spirit-infested office buildings, a mad doctor’s medical college and the prison it became, “Hoodoo Corner,” a ghost who wrote novels through a Ouija board, ghostly graveyards, school spirits, the most sinister road in St. Louis, the haunted house of the city’s most reviled murderess, St. Louis’ wealthiest Spiritualists, the true story of the St. Louis exorcism, suicide and spirits of a beer-brewing empire, and much more! This is a book that you won’t want to read with the lights out! $18 CLICK HERE TO ORDER A COPY! In 1949, the Devil came to St. Louis…. Or at least, if you believe the stories that have been told for the last sixty-odd years, a reasonable facsimile of him did. It is a story that has told for almost four generations and one that has inspired books, films and documentaries. It is, without question, the greatest unsolved mystery of the city of St. Louis and one of the most perplexing puzzles of the supernatural in American history. But is the story so mysterious because of the events that occurred --- or because of the bizarre mixture of fact and fantasy that it has become? The story of the 1949 St. Louis Exorcism has become a confusing and convoluted mess over the years. There are so many theories, legends, tales and counter-stories that have been thrown into the mix that it’s become very hard to separate just what is truth and what is fiction in the case. Finally, a book that makes sense of it all! According to documents and eyewitness accounts, the most famous exorcism in American history occurred in St. Louis, Missouri in 1949 and its story created one of the most enduring mysteries of all time. What really happened in this enigmatic case and how did the events in St. Louis go on to inspire the book and film of “The Exorcist?” And, most importantly, how much of what was reported was true and how much was fiction? Author Troy Taylor spent more than a decade and a half researching the facts behind this chilling story – searching through old records, visiting the sites that still exist and interviewing the surviving witnesses to the strange events. This new edition reveals the updated, true facts of what occurred in St. Louis in 1949 and allows the reader to judge whether the victim in the case, “Robbie Doe,” was really possessed or not. Starting from the beginning of the case in Maryland, The Devil Came to St. Louis, follows the weird events of the story, debunking myths along the way and revealing real portions of the case that are more chilling than anything invented by the "urban legends" over the years. Discover interviews and never before published details of the exorcisms in St. Louis and Maryland, the dark events at the house on Roanoke Drive and even stories and legends of what followed the exorcism --- from the strange events during the filming of William Peter Blatty's "The Exorcist" to what became of the furniture from the "Exorcism Room" at the old Alexian Brothers Hospital! Their story has become the stuff of legend, but it’s one that few people truly know. The Lemp family, and their infamous mansion, have inspired books, ghost stories and television shows, but the true story of their lives has become a confusing and convoluted mixture of myths, misconceptions, folklore and outright lies. It’s become nearly impossible to separate fact from fiction about this haunted family – until now. Author Troy Taylor takes you back in time to the opulent days of Gilded Age St. Louis and reveals the story of the Lemp family and its rise to power, wealth and decadence. For the first time, the story of the rise and fall of the family can really be told. Written with the cooperation of Lemp family descendants and featuring private stories, details and rare photographs, it’s the story that has never been revealed before. The Lemp story is one of true American tragedy – one of triumph over opposition, hard work, perseverance, genius and madness, eccentricity, passion, horror, death, suicide and ghosts. It’s a story that is played out against the changing America of the late 1800s and early 1900s, enhanced by the history of beer brewing in St. Louis, the German immigrant experience in America and by the lives and deaths of those for whom money was truly no object. It is a tale that is truly American – of a haunted family and their haunted house – told as only Troy Taylor can tell it! $16 CLICK HERE TO ORDER A COPY!